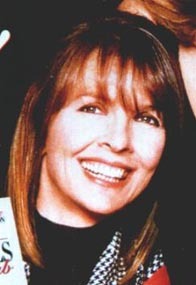 Diane Keaton was raised in Los Angeles, and first appeared on stage in high school plays and summer stock productions, then studied drama at Santa Ana College before moving to New York. She worked and studied at Manhattan's Neighborhood Playhouse School of the Theater. She learned her early mannerisms in the original Broadway production of Hair, in which Keaton played three small parts on opening night. Three months into the play's run, though, she stepped into the role of Sheila, belting out "Easy to Be Hard", "Good Morning Starshine", and "Let the Sunshine In" nightly. Her next role was the female lead in Play It Again, Sam, co-starring the author, Woody Allen. It ran for more than a year, and Keaton was nominated for a Tony for her performance. Keaton made her film debut with a small role in Joseph Bologna's ensemble comedy, Lovers and Other Strangers. Her second film is better remembered: The Godfather, where Keaton played Al Pacino's paramour. She then starred with Allen in the film adaptation of Play It Again, Sam, beginning their long screen collaboration, and falling in love with him. Together Allen & Keaton starred in several near-perfect comedies -- Love and Death, Manhattan, and Keaton's Oscar-winning turn in Annie Hall, Allen's autobiographical look at their love affair. They also co-starred in the merely delightful Sleeper, and Keaton, sans Allen, starred in Allen's first overtly serious film, Interiors. Their romance and collaboration ended after Manhattan in 1979, but Keaton was a major star in her own right by then, having been featured in several successful films without Allen's help, including The Godfather Part II with Pacino and Robert De Niro, Harry and Walter Go to New York with James Caan and Elliott Gould, and the dark and frightful Looking for Mr. Goodbar with Richard Gere. She was Oscar-nominated for her luminescent performance in Warren Beatty's politically-charged masterpiece Reds, and was lauded for her work in Bruce Beresford's compelling saga of three sisters, Crimes of the Heart with Jessica Lange and Sissy Spacek. Keaton's career probably peaked with the overwrought comedy Baby Boom and another well-received collaboration with Allen, Radio Days. After that, she starred in The Good Mother, a controversial and unpopular drama of romance and child abuse, and her career has never quite regained its early heights. She has certainly not faded away, though, and she received additional Oscar nominations for Marvin's Room with Meryl Streep in 1996, and Something's Gotta Give with Jack Nicholson in 2003. Other late career high points include Coppola's The Godfather Part III, Father of the Bride with Steve Martin, and The First Wives Club with Bette Midler and Goldie Hawn. In 1993, when Mia Farrow and Allen had a public spat over the appropriateness of his affair with Farrow's adopted daughter, Keaton co-starred in Allen's Manhattan Murder Mystery (1993).